The course is open. Play start time from 7.30 am 23rd April -26th April - hollow tine greens and top dress. 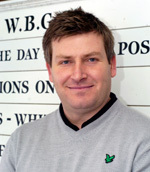 Golf Professional Mark Young offers a full range of golf coaching lessons to suit all levels of ability.